Thank you for choosing Saskatoon Prairieland Park Corporation for your upcoming event. We are invested in your success and can provide many opportunities to market your event through established digital and print mediums. This is a free service available to our rental clients. At Prairieland Park, we invite comments and suggestions in order to maintain and improve upon our service and facility. We would be happy to share any feedback attendees have about your event from our online comment card. As part of Prairieland Park’s year-round marketing plan, all events are listed on our online Upcoming Events Listing and in our monthly full-page colour ad in the Saskatoon StarPhoenix, unless otherwise stated by the client. Please note that deadlines may apply for newspaper event listings. 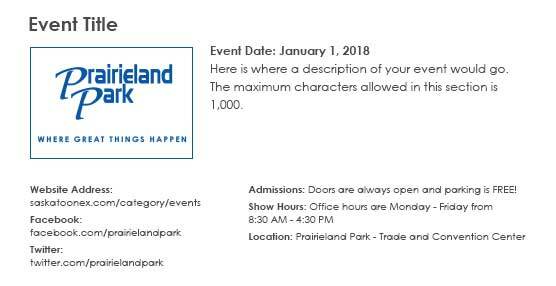 Broaden your social media reach by tagging Prairieland Park (@PrairielandPark) in your event’s social media post so we can share your information with our 5000+ followers. We also monitor and promote the hashtags #PrairielandPark and #wheregreatthingshappen. Patrons entering the trade and convention centre at Prairieland Park are met with four 75” monitors in the main foyer. These monitors will display your ad not only to attendees of your event but to anyone who enters the building for up to one month before your event. Note: Aspect ratios and formats for digital advertisements other than those listed will be rejected. Only camera-ready material will be accepted. Are you interested in advertising with Prairieland Park? Opting out does not include directional signage. Any signs that are used to direct guests to the correct doors or throughout the venue are exempt. Why do I need a profile graphic? All events are listed on our online Upcoming Events Listing. This is a free listing for all rentals clients and events held at Prairieland Park. The information provided in the Marketing Benefits form will populate your event listing.Adding a graphic will add recognition to your event. The graphic can be an image from the event or your event's logo. What can digital advertising do for me? Patrons entering Prairieland Park are immediately greeted with for 75" monitors in the main foyer. These TVs will display your ad not only to attendees of tour event but to anyone who enters the building for up to one month before your event. Prairieland Park is a year-round organization attracting 1.6 million people to various programs, conventions, and events annually.